Members of the Living Faith Christian Center congregation sing a hymn at a prayer vigil for Alton Sterling on Thursday. Sterling, 37, was shot and killed on Tuesday outside a convenience store where he was selling CDs. A photo of Alton Sterling and his family is displayed at a memorial outside the Triple S Mart on Thursday in Baton Rouge, La. Sterling was shot by a police officer in front of the convenience store on Tuesday. Baton Rouge, La., gathered for the third night in a row to remember Alton Sterling. Sterling was shot by police on Tuesday; video posted that night showed he was lying on the ground when police pulled their weapons. 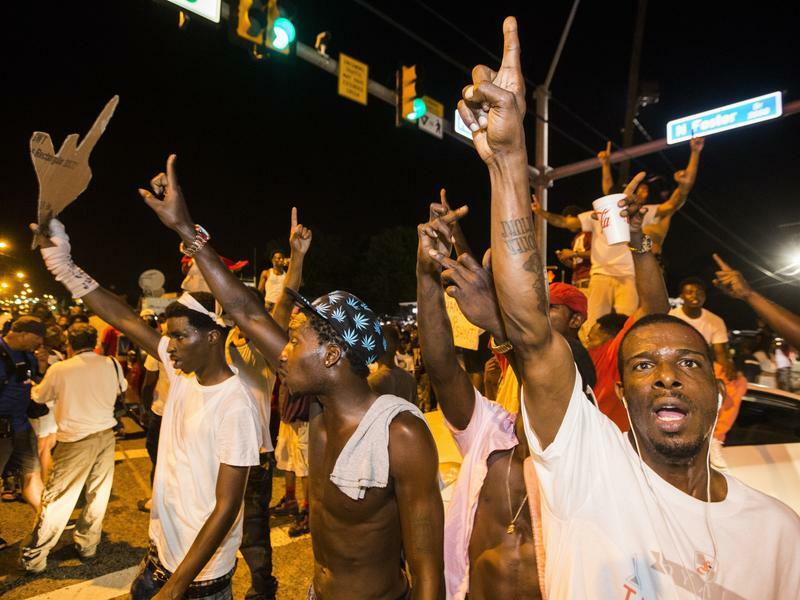 The local community quickly took to the streets in protest. On Wednesday, as the story gained national traction, a second photo was posted online, showing the shooting from closer range. 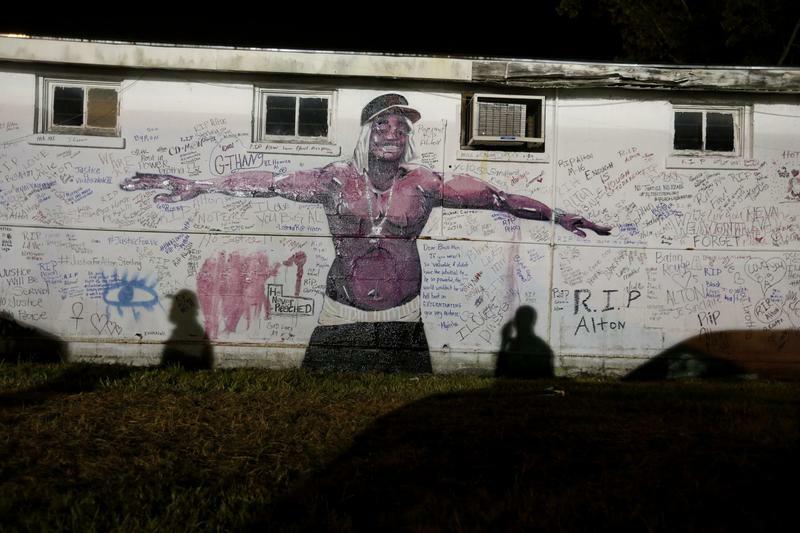 On Wednesday night, The Associated Press reports, people gathered in prayer and anger to remember Sterling and protest his death. 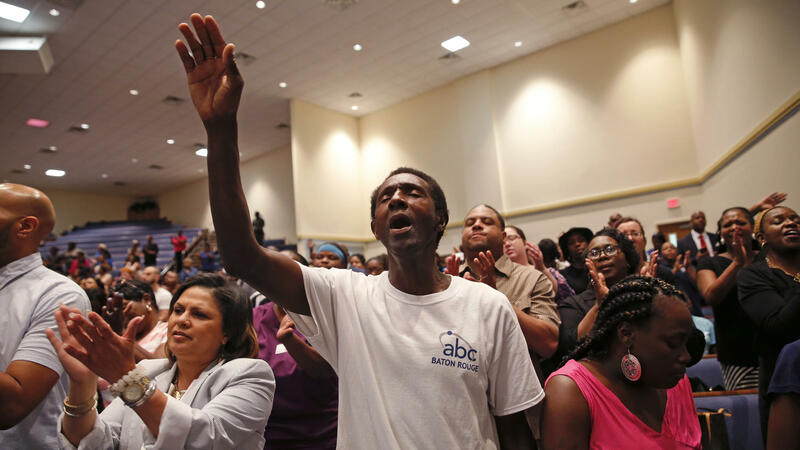 And on Thursday night, as the police shooting of a black man in Minnesota captured headlines, the people of Baton Rouge gathered at the Living Faith Christian Center for a prayer vigil in Sterling's honor. Gov. John Bel Edwards spoke at the prayer vigil, which was attended by hundreds of people, reports NPR's Caitlin Dickerson. The governor said the shooting should bring a new focus on law enforcement training, reports Elizabeth Crisp of The Advocate. "That's one way we are going to come out of this tragedy better than we were before," Edwards said, according to Crisp. Outside of the church, protesters critical of the prayer vigil chanted and sang — arguing it is not the time for church. Caitlin described the mood in Baton Rouge earlier Thursday, and said people are still digesting events. "They're certainly looking for more information," she said. "People here are anxious to find out what the ongoing investigations will turn up." "Four previous 'use of force' complaints were lodged against the two white police officers ... and they were cleared in all of them, according to internal affairs documents released Thursday. "The complaints included three black men and a black juvenile. One of the men was shot when police said he pointed a gun at them and the others were injured during arrests and a police pursuit in a vehicle." But, Caitlin notes, "It's worth pointing out that it's not usual for police officers to have use-of-force complaints [filed] against them, so we can't extrapolate a whole lot from the complaints alone." Meanwhile, crowds are gathering across the country — including in Chicago, Atlanta and New York City — to protest the deaths of both Sterling and Philando Castile, shot to death by a police officer Wednesday night in Minnesota. In New York, the crowds have grown to the point where they are blocking traffic on some streets, NPR's Hansi Lo Wang reports. The aftermath of the police shooting of Alton Sterling in Baton Rouge is a developing, fluid story. In breaking news situations, some information passed along to our reporters may later turn out to be wrong. Our editors and reporters make every effort to ensure information comes from reputable sources, and this post will be constantly updated as we receive new information. Protests continued in Baton Rouge last night over the police killing of 37-year-old Alton Sterling.  WWNO’s Ryan Kailath was there. 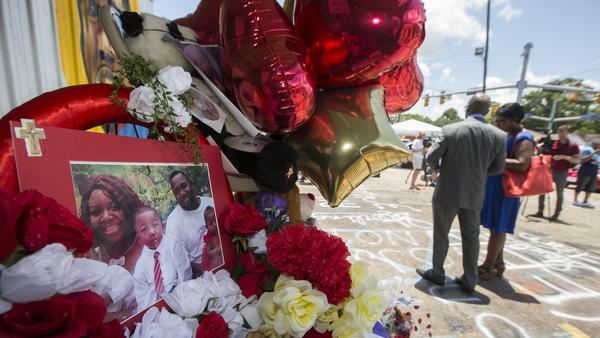 Two black men have been shot and killed in the past two days by police officers. Both shootings were captured on video.